Hello out there! My name is Kat and I have a love for crafting! One of my most favorite crafts is crocheting, so I started a shop about 2 years ago and things sort of took off from there. My shop is called Rebel Skein, and because the main purpose of this blog is to share crochet patterns and tutorials with you all I thought it was appropriate for a blog name too. My abuela taught me how to crochet when I was 5 years old. As a kid, I would make doll clothes and pot holders. As I got older, I liked to make my own quirky accessories. I was always a little odd when it came to fashion...okay, I was very odd! My junior year of high school I dressed like an old man every single day for the entire year. I had a closet full of plaid golf pants, bright polo shirts, and Cuban guayabera shirts. There was another year where every piece of clothing I owned was shiny, sparkly, or fuzzy...that was an interesting year. My shop and my kids are a full time job! I have 2 crazy, rowdy, goofy boys that keep me pretty busy. Eli is 7 and Evan is 2. I have an addiction to internet cat videos, and I listen to way too much 90's alternative music. I love sci-fi! Huge geek here. Star Trek, Battlestar Galactica, and Doctor Who are among my favorites. I'm sure I'll be sharing plenty more about myself in posts to come, so enough about me for now! SC in next, slip stitch into last stitch on opposite side, finish off. then slip stitch all the way down to the joining SC. Slip stitch into joining SC. from hook, then slip stitch next 2 chains. Slip stitch into joining SC on head. Slip stitch into next SC. SC down to joining SC, finish off. For row 8, please explain SC2tog. I don't understand! Amazing pattern! You did a great job. Thanks for sharing! I used the appliqué on a baby blanket I made for a family member and it looked adorable. Just one correction, the very last step should say sl st down to joining SC (instead of SC down to joining SC). Nice work on the pattern and thanks so much for sharing! I just did this cute but my hook was too big and my deer is huge . to big for my son's hat.. So I'll make another and just make my husband a hat with the big one! Thanks so much for this pattern is so adorable! Wonderful pattern!! Thank you so much!! Thanks so much everyone! I'm glad you love it! I'd like to let you know that if you need any help and I do not answer on here you can message my Facebook page at www.facebook.com/rebelskein. I sometimes forget to check my blogger notifications. Do you have a video for the deer head. I have run into trouble. Would like to see it made. What is the size does it make? baby? toddler? kids or adults? I got the ears done., the antlers are confusing to me. Could someone tell me the Yarn used? Thank you! Hey! I just use worsted weight, but if you have sport weight it will work up a little bit smaller. Whatever you prefer. Thank you for sharing!! 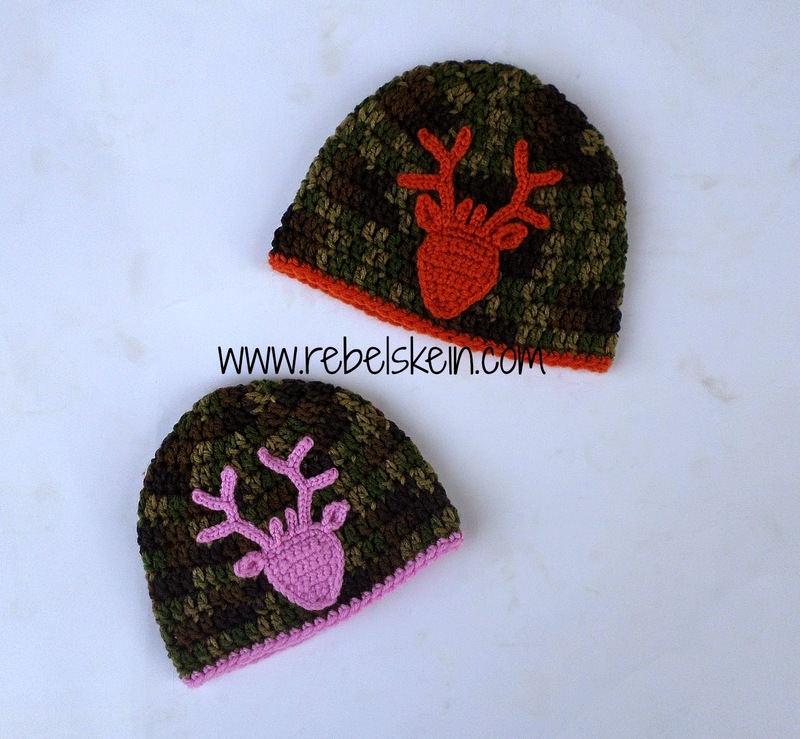 I've been searching and searching for anything deer or elk for a hat or scarf to use, this is perfect!! I have 5 nieces and nephews that love their camo hunting! Awesomeness!! How do you attach it to a hat? Sow with yarn? Sow with thread? Iron on stuff? Hey there. You sew it on with yarn or thread. I prefer sewing thread. Hello Young Lady...how do I make the pattern bigger?